By now you know what a geoduck is. But what's a crudo? Besides being a hip culinary term that seems to be increasingly fashionable on both coasts, crudo means raw in Italian and is used to describe a raw fish dish that usually incorporates olive oil, sea salt, and some sort of citrus or vinegar. 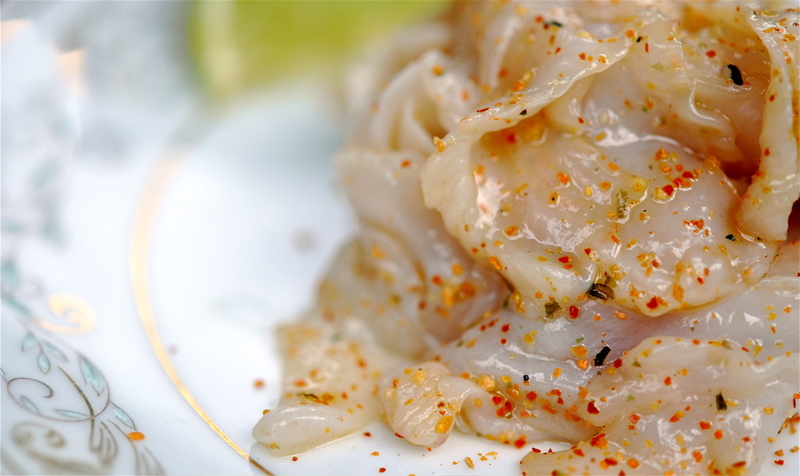 For shellfish enthusiasts, a crudo is another way to enjoy the raw neck meat of a geoduck clam. In past posts I've written about Geoduck Sashimi and Geoduck Ceviche. Now add this crudo to the repertoire. I boosted the basic recipe with wild wood sorrel (Oxalis oregona) for an extra tart and lemony edge. You can also use sheep sorrel (Rumex acetosa) to the same effect. The two plants are unrelated, but each contains oxalic acid, the compound responsible for the tartness. 1. Blend the wood sorrel, olive oil, and sea salt in a food processor until the wood sorrel is pulpy. Using a baking spatula, remove mixture and press oil through a wire mesh strainer or cheesecloth into a small dish or glass. 2. Slice geoduck neck as thinly as possible and arrange slices on a plate. Drizzle sorrel-infused oil generously over geoduck and garnish with a few shakes of Shichimi Togarashi and lime juice. For a chunkier alternative, use a mortar and pestle to pulverize wood sorrel, olive oil, and sea salt. Spoon over geoduck. This is definitely something that I've never tried. But the recipe sounds interesting! If I can ever get my hands on some Geoduck I'll definitely give it a try!